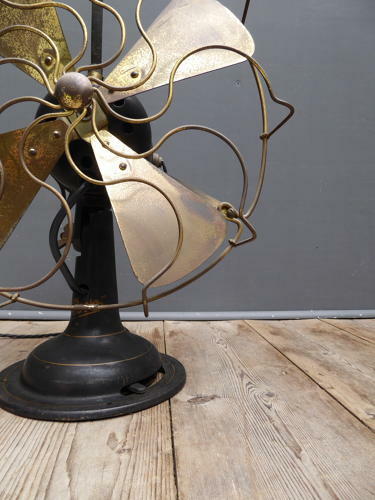 A beautiful early vintage electric fan by Revo. In original black paint with gold coachline detailing & branding, this electric fan would likely have been the flagship model of the Revo brand. Employing a brass guard & blades, a cast iron base & three speed motor, the build quality is as good as it gets & the fan displays beautifully. Wear commensurate with age, good overall though cosmetically unrestored showing the usual signs of age. The fan retains it's original wiring in places & is untested for electrical safety (exit wire a recent replacement, wiring in the upper section appears earlier). It works as it should (if a little slow on 'speed one') but as always we recommend an electrical safety check by a qualified electrician prior to use. I would also stronly advise the fan is kept away from children given the speed of the blades & gaps in the guard!